Before I begin cleaning, I would like to share some of my spring cleaning tips with you. 1. 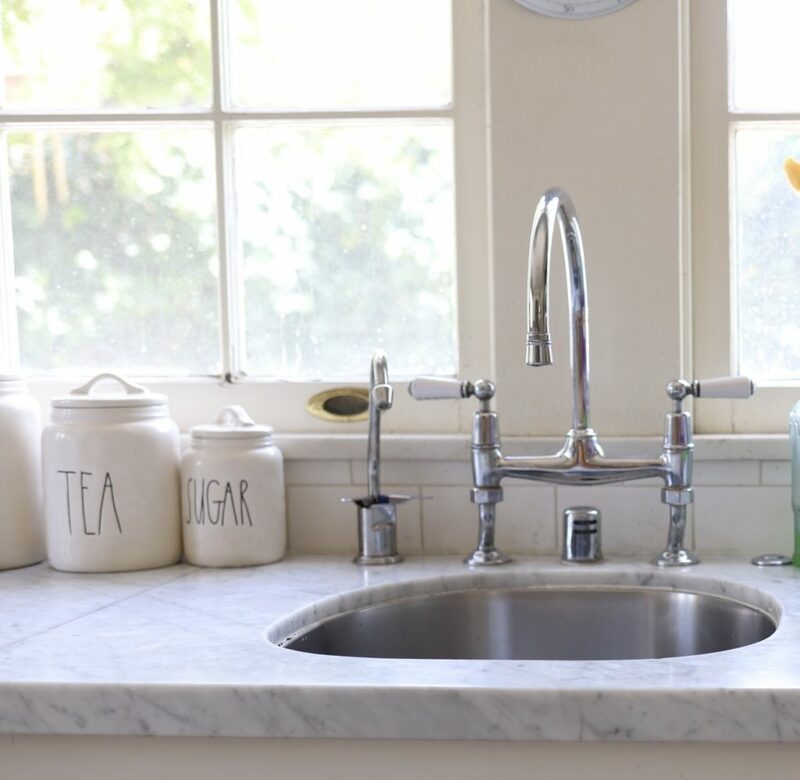 Did you know which five spots in your home likely have the most germs? They are your common area doorknob, kitchen drawer knob, kitchen countertop, bathroom sink, and bathroom sink handle. Viruses that cause colds and the flu can survive on common surfaces for up to 72 hours. I use Clorox® Clean-Up® on all of these surfaces because it kills 99.9% of germs (use as directed on hard, non-porous surfaces). 2. Clean every room from top to bottom. When you think about how to spring clean your home, it’s important to start from the ceiling down. This will cause dust and debris to flow downward and keep you from having to re-clean your space. If you have a vacuum with an extension hose, use it to get cobwebs and dust from your ceilings and fans first. Then, dust your furniture and other items before vacuuming all the dust and debris off your floors. This will save you time and result in a cleaner room. 3. The best way to get rid of lime buildup around the faucet it is to lay paper towels over the fixture, soak it with vinegar and let it set for an hour. The deposits will soften and become easier to remove. 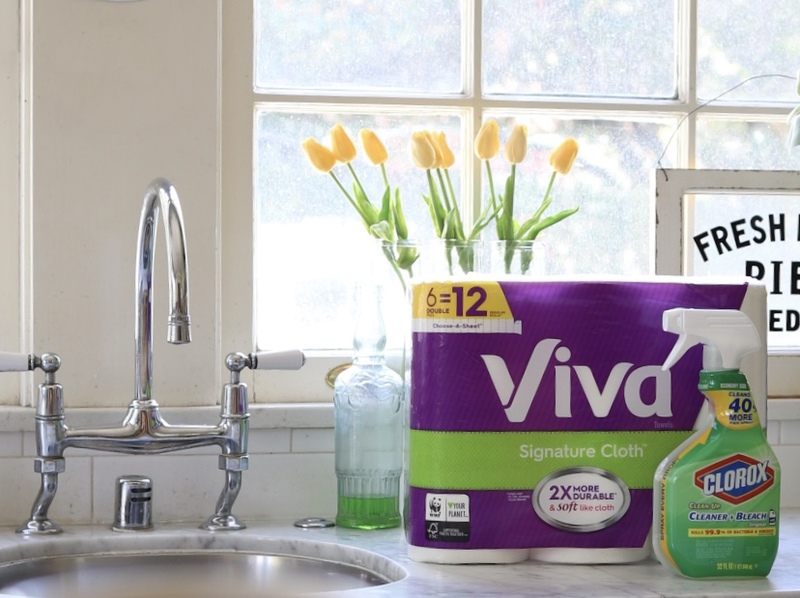 The paper towels I use are Viva Multi-Surface Cloth and Viva Signature Cloth. The Multi-Surface Cloth has a new, 2-ply product that is strong, soft and absorbent. The Signature Cloth has a unique softness that feels more like cloth than paper to me! 4. Use this dishwasher cleaning method every six months or so. 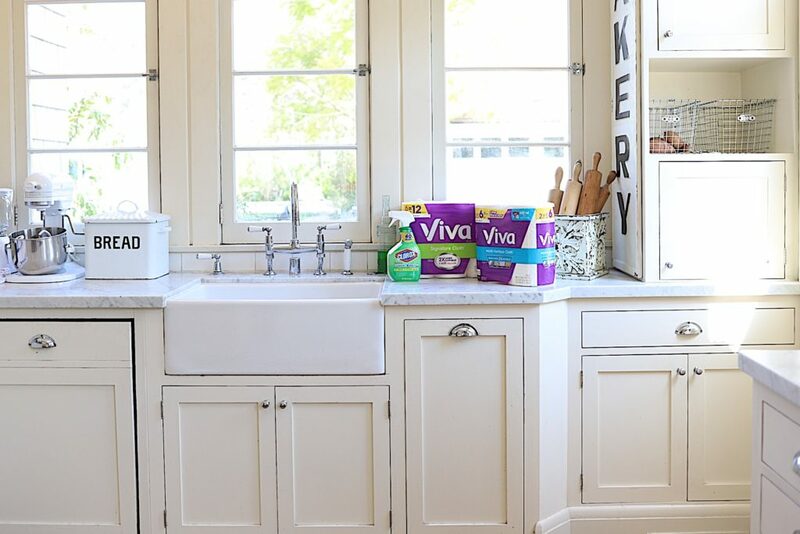 The first step is to run a cycle with one cup of vinegar in a dishwasher-safe bowl on the top rack. Then, sprinkle a bit of baking soda on the bottom of the washer and run it again. (Short cycles are fine.) The vinegar and baking soda combined will help to clean out any food particles and leave it smelling fresh and clean. 5. Disinfect your sponge in the microwave. Just fill the sponge with water, place it on a Viva Signature Cloth, and cook it on high for two minutes. 6. Clean your mop with vinegar. Fill a bucket with one gallon of hot water and add one cup of vinegar. Soak for thirty minutes and rinse with water. 7. To clean windows, start off by cleaning them on a cloudy day to reduce streaking. 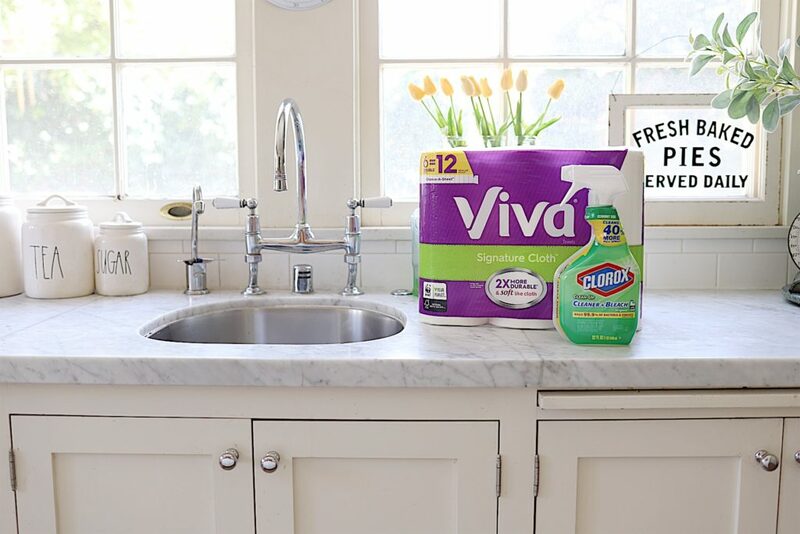 Mix a cleaning solution of eight parts water to 1 part vinegar, wipe them down with Viva Multi-Surface Cloth and your windows will look fabulous! 8. Don’t forget to replace your furnace and HVAC filters. This is one of the most important and overlooked parts of spring cleaning. Replacing a standard filter with a more robust one with a high MERV rating will help keep you healthier as you enter spring. I hope you will use some of these spring cleaning tips to make your spring cleaning easier. 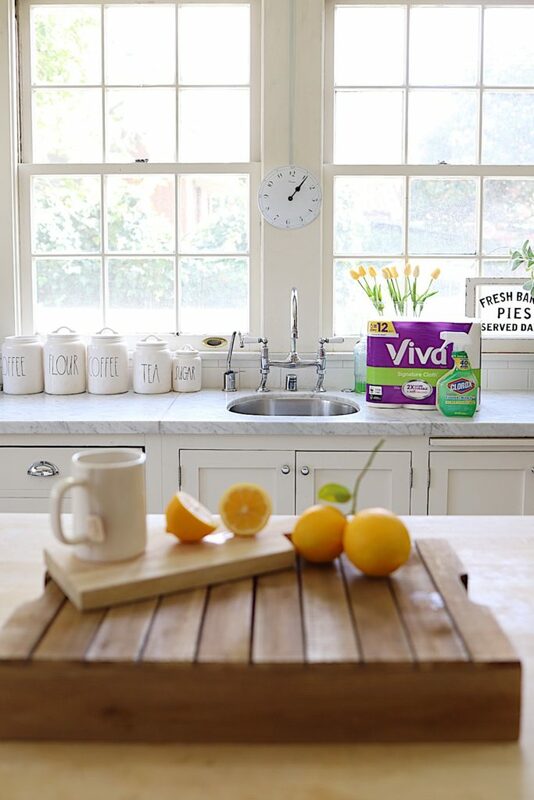 A good, deep spring clean-up is what we all need to create a healthier home. Thanks for the tips, but please remove the visual which interferes with reading the post. Oh man do I feel ya with that cold! I also had it and finally had to go to Urgent Care to get antibiotics. 5 weeks with it about did me in. Make sure to try and get as much rest as you can. You’ve been running around like a crazy lady lately with all you have going and it can wear you down for sure. Thanks for the tips. I love using vinegar and baking soda for so many things. Hope you feel better soon. Thank you so much! I have had a cold on and off since Christmas! Hopefully my super clean kitchen will help.